When I had first started this blog one & a half years back........I hardly had any idea that I'll be liked & embraced by so many wonderful people around the world.......sigh! Day in & day out, I pride myself in the growing number of blogging buddies that I have all over the world........according to my mom, I've always been a person with innumerable number of friends everywhere.......and I'm always one of the most well-networked among my friends & colleagues! Hence, I LOVE every new friend I make through this wonderful media of blogging. 1. You have to thank & link back to the person who has passed on the award to you. 2. You have to share 7 random facts about yourself. 3. 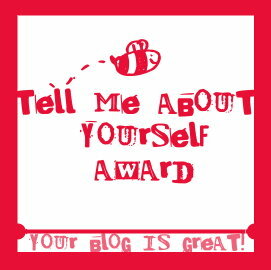 You have to pass on this award to 15 more bloggers. I'm NOT an early morning person. I can stay up all night if you want me to....but early morning? No...thanks! Fashion is my poison. Nothing intoxicates me more. My sister is 10 years younger to me. I'm currently reading Queen of Babble Gets Hitched by Meg Cabot. I often borrow from my sister's teen fiction collection. Music never fails to soothe me....no matter what state of mind I'm in. That said & done, I'm moving onto the other thing that put a BIG smile on my face! Uparna has been wonderful enough to feature me in her first edition of "A Vogue Idea" that she has written and her chosen topic was The Statement Necklace. She has been too sweet with all the lovely things she has written about me & my blog.........and not to mention, my brand Howrah Bridge & it's line of accessories, specially statemnet neckpieces!!! Read her lovely post here. Thanks a bunch Uparna for making me feel so loved.........I'm flattered! Will be back with another outfit post soon! Till then, keep it stylish! Awww you are so sweet my dear. Yes I am loving this blog community that we are in. I've only been blogging for a little over a month now and I've made some great friends, you included ;) We sorta have something in common - my next oldest sister is 9 years older than me. There was such a big gap between me and my siblings that I felt like I was the only child most of the time. Thanks for the award my dear, I will try to incooperate it into my blog this week! thank you so much for this award :) you are such a sweet heart ! aww thank you for the blog award, hun! i love these kinds of posts where i get to learn more about the blogger! 1. i love writing even before i knew writing, author of f factor, about NIFT lyf, the undeniably most fashionable institute of india. 2. got into arranged marriage which never looked like arranged one, am so blessed. 3. have lived in all metros in last five years. 4. i never say no to chocolates no matter what. 5. camera is my fav possession. 6. you are a wonderful freind even we dont talk daily. 7. i truly beleive in if u follow all rules u will miss the fun. I was missing you a lot, my princess. Awwwww, thank you so much for awarding me! I'm trully honored and flatered to know my blog is inspiring you! Congratulations, you are a very nice person and you totally deserve this prize! This post is so sweet! Love how you write so honestly! Great that you one an award! You deserve it! You sound like such a sweetheart!!! Having blogger friends all around the world is indeed amazing. I know what you mean by saying you're not an early morning person. There's nothing I hate more than to wake up early in the morning. I mean, what's the rush? i see you have other lovely awards too..
hello! thank you for visit my blog! i hope you would like it! i also like yours! i invite you to come back for my next post! what about follow each other? Congrats on teh award and the feautures! Best part of blogging is meet with people you would never get the chance to know otherwise! Thank you so much for passing the award on to me. I've been away all week (still am away)... But I wanted to make sure I thank you before I forget!